Description: One day, our main character Clay comes home to find a box with cassette tapes and a letter that happen to be from Hannah, a girl he goes to school with who committed suicide a few weeks before. As it turns out, he'd been secretly crushing on Hannah. 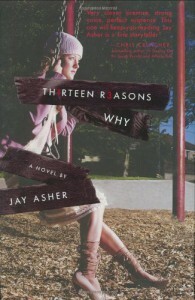 When he finds a cassette player and plays the first tape, Hannah explains that in the following tapes, she will talk about the people and events that led up to her taking her life, and once the tapes have been finished the person must pass along the tapes to the next person on the list. I really liked this story. I thought it was really well written and was an interesting perspective. The main character, Clay, is very likable. You really feel for him in this book, especially as he goes through the emotional turmoil of learning what caused this girl to be in so much pain she thought it would never stop unless she made it end. It was a sad story, definitely. I wish I could give a better review, but I read it a few months ago and I'm having trouble remembering specifics of what I liked about it. I liked the way he framed the story, and the mystery as to why Clay was on the list and how he had contributed. The entire time I was reading it, I felt like Clay was a good guy and couldn't fathom what he had done to end up on Hannah's list. Over all, it was really well done.